Rosenberger’s new EMC laboratory in Fridolfing has been in operation since beginning of this year. 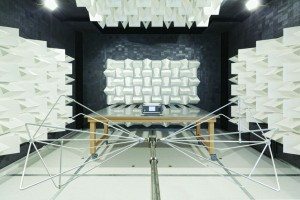 The centrepiece of the lab is an anechoic chamber for EMI emission measurements at component level according to EN 55025 (CISPR 25) as well as EMI immunity measurements according to ISO 11452. Special cladding, with ferrite and hybrid absorbers, enables measurements in the frequency range from 9kHz up to 18GHz, by means of antenna, coupling clamp as well as stripline. Other available testing services include signal integrity measurements on high-speed data connections, coupling mechanisms within high-voltage systems or measurements of the far-field radiation characteristics of active and passive RF components. For special customer research and development requirements, the EMC lab offers EMI measurements on request. This entry was posted in Electro Mechanical, Electro Mechanical, Europe, Global, Miscellaneous, Miscellaneous, On Ticker, top articles, UK. Bookmark the permalink.